Sad to hear about Sunanda Tharoor’s un-natural death. Marital discord and health problems may have pushed her over the brink but Sunanda was a vivacious lady and a lady you never ever expected will take her life. But yes all was not right in Sashi and Sunanda Tharoor’s three year old marriage. Since past six months, Sunanda was spotted at social soiree unaccompanied by hubbie, Sashi. Then Delhi’s power corridors buzzed with the news that high-command advised the couple to keep things cordial in public life because of the ensuing elections and not letting opposition to throw muck. Lately since Sunanda was diagnosed with Tuberculosis in her stomach she used to say that she wouldn’t live long. Nobody ever thought in their dreams that she meant ending her life. The last 72-hours when twitter war between her and Pakistani journalist – Mehr Tarar became headlines, Sunanda snapped. This is evident from the no-holds barred interview she gave to Indian Express and NDTV. Express carried the story but NDTV abstained. 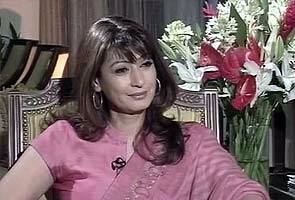 Sunanda also called up editor of Headlines Today to do an interview. In her interview with Express, Sunanda vented about her marriage going awry and Sashi having an affair with Mehr Tarar. She openly spoke about divorce and even said that she shielded Sashi Tharoor from IPL scandal and took upon herself all the blame. Post her no-holds barred interviews with the media, Sashi and Sunanda had a heated row and then they sent out a joint statement saying all is well between them. This must have triggered Sunanda for taking the extreme step. Sunanda was last spotted at 3:30pm on Friday at the Leela Palace Hotel in Chanakyapuri. When Sashi Tharoor returned from the Congress Convention to the hotel around 8pm and found Sunanda not opening her suite # 345, hotel staff broke open and found Sunanda dead. Really, really sad. She must’ve been really upset to rant and rave on twitter like that and out the affair. doesnt look like a suicide and she was def not ill (the KIMS docs have gone on record with a statement)…with these 2 ruled out… I hope the truth comes out. They were in separate rooms, so not together at the hotel. I never quite understood why the press (especially the supposedly broad minded English speaking one) were so savage towards her. From ridiculing her English to her dress sense, from insinuating against her background to leaking her pre and post operation plastic picture (with the help of her Padmavibhushan winning plastic surgeon, no less) they left no stone unturned to insult her. There actions were actually more downmarket than Sunanda’s. My heart goes out to her son more than anything. I hope he finds strength, resilience, happiness and prosperity now and in the future. P.S. The Kochi IPL issue was so obviously related to Tharoor and not Pushkar. Why else would someone hand out 70 crores to a mid level manager/entrepreneur? Even if Shashi Tharoor had an affair or fell out of love, Sunanda should have opted for separation/divorce. Overdosing drugs/consuming alcohol is not a solution.I think she should have taken things a tad bit easy. I feel sorry for her son. I hope he finds strength. Indian media is reaching heights. When a poor soul has passed away, news channels are posting silly breaking news. Sunanda was seen crying as she checked in to the hotel. Seriously?!? I saw another news channel, headlines today, i guess broadcasting a mobile footage of sunanda’s lobby. Is it necessary? What’s with these senior journalists giving media bytes to pvt publications? I thought it was unnecessary esp when someone has passed away. sorry to see her go. She really did have the audacity to dream and reach for the sky, whatever her modus operandii. I do admire the distance she covered in one lifetime. doesnt look like a suicide at all from all the media stories.. why has everyone gone quiet and no one is ready to speak up.. any other case of mystery death they would have called for truth.. Here is what Malavika wrote in Mid Day… Do you have any idea what she is referring to here? Delhi-based friends of the couple have been alluding to powerful third parties who have come between the two for many months now. These involve names so sensitive and people so high up in the national firmament that even we so accustomed to hearing about the escapades of the high and mighty, thought it best to ignore what could be the biggest scandal of all time, until it was confirmed. But now that the flood gates have opened, how long before stories surface that will make the Mehr Tarar episode appear like a teddy-bear’s picnic? 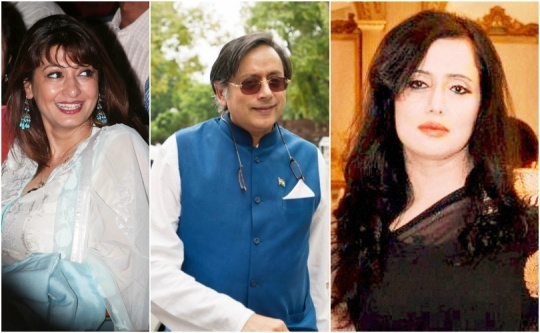 Sunanda Pushkar hob-nobbed with powerful Indian politicians even before knowing, dating and marrying Sashi Tharoor. In fact it is one those powerful ones who introduced Sunanda to Sashi. These powerful politicians I am referring to are in the cabinet of the UPA-2 government and are close to ‘high-command’. I doubt Sunanda had direct access to 10 Janpath. Malvika Sangghvi may be prive to such information. No No Shashi T has access to 10 janpath… he is said to be close to both Sonia and Rahul. of course there are many who want to pull him down..